Original Article found on 13 WMAZ. St. Patrick’s Day is here and we’re feeling festive. We put out a call to viewers for the best places to grab a pint in Central Georgia and while ‘home,’ is a great place to grab drinks, not everyone can come unless you’re having a party (let us know if you’re having a party). - Come for the food and stay late for the drinks. I had never been to Brick Yard until a few weeks ago, but it’s easy to see why it’s recommended by people in Dublin. The two bars, live music and the friendly staff give off a real sense of community that remind me of my days at UGA. Oh, and it&apos;s also Pat Cavlin approved. - Growler USA has only been open for a few months, but has already left a significant mark on the community in Kathleen judging by the number of viewers that recommended this place. While I’ve never been, I trust you all enough to not lead other beer enthusiasts astray. - There is no ‘grabbing a pint,’ without mentioning either Just Tap’d location because they offer a very, VERY extensive selection of brews. If you’re in a rush, they also sell growlers of any beers on their menu and you can even get their food to go as well! It’s a win-win. - The most family friendly spot on this entire list is Rigby’s because they’ve got something for everyone. Games, mini-golf and laser tag for the kids during the day, and an oyster house, beer fest and bottomless mimosas for the adults as part of their St. Patrick’s Day Fest. - Pizza and beer…name a more iconic duo, we’ll wait. 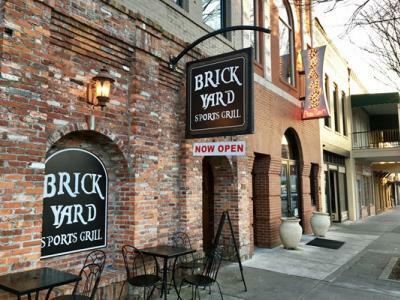 For nearly 25 years, The Brick has fed and quenched the thirst of thousands of college students and Milledgeville visitors alike. Not including the Brick would be a disservice to viewers. Central Georgia’s own Chris Taylor will also be performing at their St. Patrick’s Party from 11 p.m. to 2 a.m.
- The Bird is always a great place to go, whether they’re hosting the Beer Olympics, a dart tournament, or a local band. Thursday night is pitcher night if you&apos;re looking to celebrate early and Friday night’s St. Paddy’s Day festivities include a performance by Broadcast 90: The Ultimate 90’s Rock Tribute. Smoking inside is allowed. - When I asked Jobie Peeples what the ‘most poppin’ place in Milledgeville was for drinks, there was no hesitation before she answered The Velvet Elvis. She says besides for their ‘bomb’ chicken tenders, people gather there for drinks late into the night because they close at 2:30 a.m.